Winds coming from three-quarters of the compass rose and between 2 and 32 knots in strength, rain, thunder, lightning and bright sunshine with temperatures of around 26o – today was varied in nature! 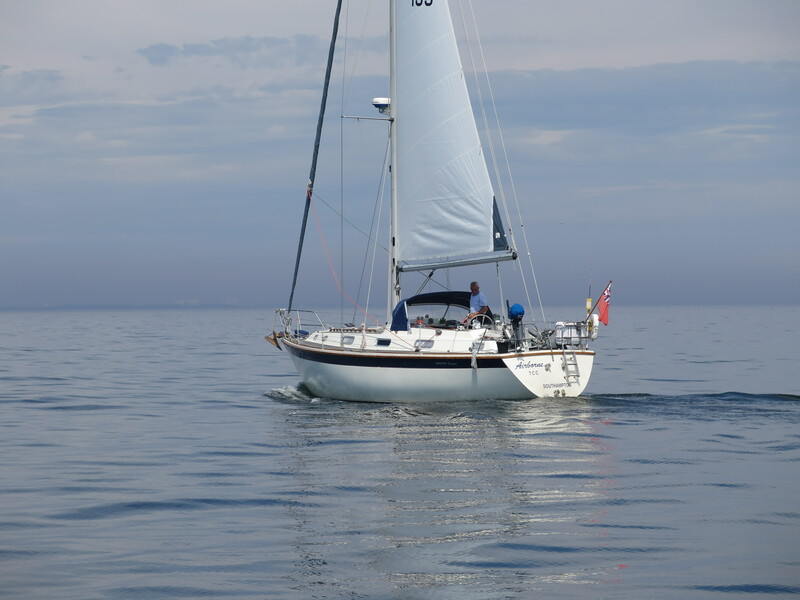 We set off from Borgholm around 9am and motored out of the harbour into winds gusting around 30 knots. Luckily they were from the south so we hoisted two-thirds of a jib and hurtled north at over 6 knots. Within half an hour the rest of the jib was out and we were doing around 4 knots and within another half an hour the engine was on. From then on we played a game of ‘guess what the wind will do next …‘. We mostly lost. At times we managed to sail slowly, but then the wind would drop and go right round. Other times we had waterproofs on with the rain and thunder and lightning, but then it would quickly dry out. Eventually around lunchtime the weather settled down and we had bright (and warm) sunshine. 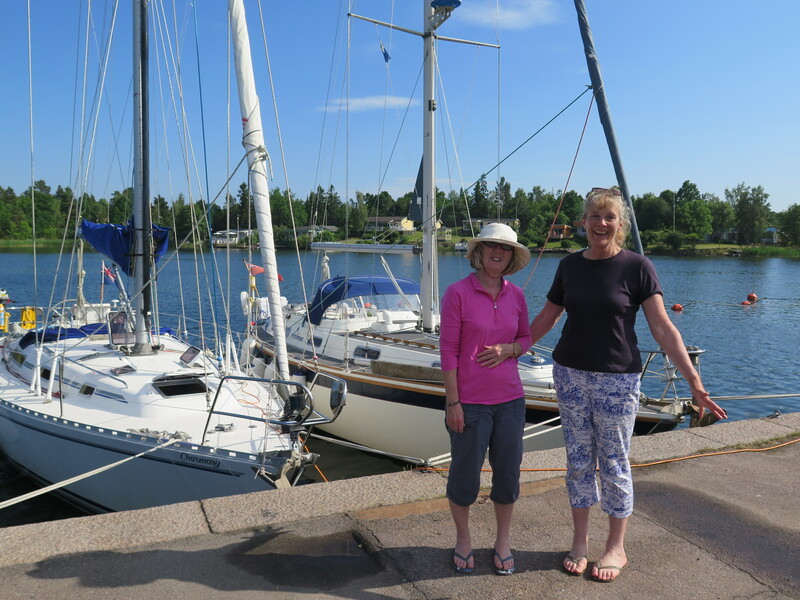 We spent the trip in company with Pat and Stephen on Airborne and they led us through the inshore passage between Oskarshamn and into Figeholm. The passage was beautiful, but you do need to like rocks. We saw plenty – many of them close either side, but luckily the passage is extremely well buoyed. Figeholm itself is beautiful. Good shelter, friendly and quiet. In fact, it would seem that it is a lot quieter than in the past. 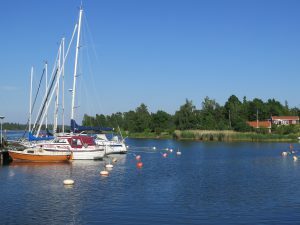 It has been a timber shipping port since the 1500s and in the 17th century Vastervik and Kalmar competed for the right to control the timber trade through Figeholm. After 1850 it expanded fast and a successful shipbuilding industry was established with over 100 ships having been built here. Now you would be pushed to know that anything had been built here with little evidence of the trade remaining. The guest harbour is fairly busy with many German boats and apparently the area is popular with Germans, many of whom own second homes in the village. The boat club who run the harbour were busy preparing for their midsummer party which they hold on a small island on the way into to town. We did get an invite, but they told us we would have to make our own way to the island, so we decided to go swimming instead – very refreshing and surprisingly warm!